Since the first outburst in Harvey Weinstein sexual assault allegation cases, the world has been promoting a variety of causes with a hashtag, “#MeToo”. The viral “#MeToo” hashtag saw a widespread participation of women from across the globe, sharing their experience about sexual abuse and harassment. 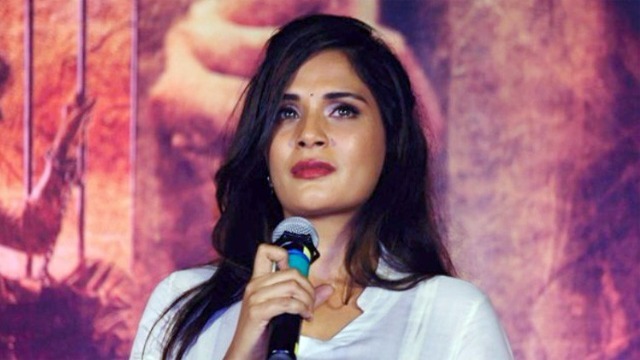 While women across the country have been promoting the campaign for a cause on social media, Bollywood actress Richa Chadda is a new face who has opened up on the #MeToo campaign. The actress wrote an explosive blog, which is quite a reality check. “For a country where violence against the girl child starts in the womb, I am surprised at the number of people surprised at the enormity of the #MeToo campaign. Unless you have been in hibernation in the Himalayan caves for the past millennium, there’s no way you would not know that sexual assault- verbal or visual, and gender violence are the rites of passage for the average Indian girl. The navratras are a special time in the culture of our great country. Navratras also bring with them, the glorious garba in Gujarat and the Durga Pujo in Bengal. It is a sacred time when the Goddess is worshipped all over the country, in myriad forms and traditions. Growing up in Delhi, I have fond memories of ‘kanjakein’ or Ashtami. It’s a day when pre-pubescent girls are worshipped symbolically as Goddess Laxmi. I would cherish this day, awaiting the vast number of pencil boxes with 5-Star chocolates inside, hairbands and other knick-knacks that I’d receive along some great food from neighbours and relatives. Coins would jingle in our pockets as we sprinted home. The navratras make me feel proud of belonging to a tradition that acknowledges, reveres, worships and in fact CELEBRATES the feminine. This year the onset of navratras was marked by women protesting sexual harassment in the BHU campus. (Just like girls in Haryana who said they couldn’t walk to school because they were harassed everyday, which explains the dropout rate). The protests turned violent, there was arson, the VC blamed the women who were beaten and a thousand have FIRs to their name. The BHU issue was politicised , as I am sure some will this blog, as is practically all else these days including songs, students, movies, academicians, the army, language, awards, monuments, currency, cricket, tax, TV journalists-that-are-closet-actors, food, and even colour. Mera orange, tera kya? Hell, I’d like to be born a man to simply feel free of all this cumbersome responsibility. I could say, do and be whatever I want. I could take a bike ride late in the night without being a bait, stand and smoke under a tree with my buddies, loiter and laugh loudly, even pee in the open, use cuss words with abandon, walk tall without a book across my chest, man-spread, be whatever version of myself I want to be. Boys will be boys. Cute. If half of the population is hugely disadvantaged one way or another, how will India EVER be a superpower? Are you an #Indian? How are you not worried? Don’t say I have a film releasing in a week, hence this is for publicity. The people this blog will resonate with are hardly a first-day-first-show kind. Also, it would only serve to highlight the point I put across. Misogyny is to society what nitrogen dioxide is to the air we breathe – no matter what we do, we ingest a little. Not all men, but #ALLWOMEN I know have experienced gender violence or molestation one way or another. This shouldn’t it be the only way of life women know. Are you human and hence born from a woman? How are you not embarrassed ? The letter received a thumps-up from renowned author and politician Shashi Tharoor, Manoj Bajpayee, Pritish Nandy and people from different fraternity. Previous : Tweeple Called Sonakshi Sinha as Reena Roy, After Shatrughan Sinha Mistakenly Wished Kader Khan With Big B’s Pic!